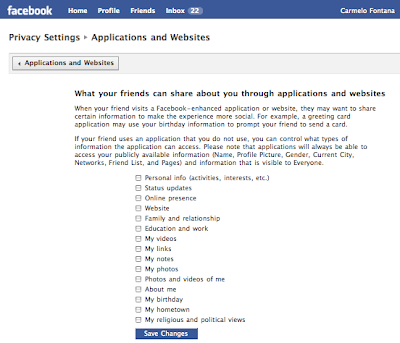 Facebook keeps asking me if I intend to change my privacy settings or stick with the old ones. Well, I tried to choose the latter but it looks like my decision was not convincing for Facebook... In fact, when today it prompted me again with the same question (and I replied in the same way) I found that my "old" settings were not the old ones whatsoever. So, I patiently had to go back, review and re-uncheck everything... because, in case you had any doubts, the default settings are such that you share everything. So, why don't they just come clean and start asking whether you want to manage your publishing settings? I am deleting my profile... so much easier.